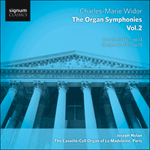 Less overtly polyphonic than the First, the Second emphasises tone-colour: ‘Widor,’ says Near (1991), ‘seems to be taking the listener on a timbral tour of the organ’, with each movement featuring ‘fresh combinations’ of sound. The 1901 edition introduced several changes to the original—most drastically the (arguably mis-advised) replacement of the original fourth movement, a chattering, fugato-gifted E major staccato scherzo in 6/8, with a (compositionally later style) Salve Regina in D minor, drawing on the Gregorian antiphon for the Blessed Virgin Mary. ‘Hail, holy Queen, Mother of Mercy, our life, our sweetness and our hope. To thee do we cry, poor banished children of Eve; to thee do we send up our sighs, mourning and weeping in thiés vale of tears.’ Near believes that the distinctively sectional character of this chorale fantasy ‘suggests the alternatim practice commonly adopted by the grand organ and choir organ in large French churches’. Towards the end, against a texture of left-hand semiquavers, the pédale trompette, fortissimo, sounds the closing line of the plainchant: ‘O clemens, O pia, O dulcis Virgo Maria’ (O clement, O loving, O sweet Virgin Mary). The fifth movement, an Adagio in D major, was written originally (uniquely) for just the short-resonating voix humaine, re-registered in the 1887 revision. The change of tempo to Andante in 1901, contradicting the Adagio heading, ‘seems never to have captured Widor’s attention’ (Near). The 1901 re-labelling of the 3/4 first movement—from Prélude to Præludium circulare—would appear to have been a gesture drawing attention to the petit labyrinthe harmonique trajectile of the music: mirroring a tradition from the early sixteenth century onwards, including Beethoven and Chopin in the generations preceeding Widor, it begins and ends in the tonic but en route orbits chromatically through the keys. Placed second, and broadly unchanged in subsequent editions, the 12/8 G major Pastorale, ‘replete with grace and aural colour’ (Near), inhabits a post-Bachian/Berliozian world, somewhere between Jesus bleibet meine Freude and L’enfance du Christ. In March 1870 Ménestrel reported Widor playing ‘a beautiful fantaisie pastorale’ at Saint-Sulpice: the Pastorale of the Second Symphony, Near wonders (2011)? The ensuing Andante in B flat major is a chorale-like scena (on an anacrustic theme determined by repetitive two-quaver/two-crotchet patterns) displaying Widor’s schooled command of motivic and sequential development. Likewise his habitual pleasure in key-shifting. Scarcely has the theme been announced before we are sharing a calvados or two with D major, F sharp major, B minor, G major/minor—the start of an adventurous ramble. Anticipating the Fifth Symphony (1879), the tripartite Finale is a grand toccata—slurs and staccato as critical to its thematic profile as harmonic thrust and resolution are to its architecture.